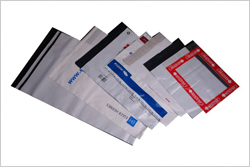 Tamper Evident Bags have a tamper evident closure system. Once the bag is sealed, anyone opening it leaves an obvious trace. This key feature combined with a unique numbering system and tear off numbered receipts. The Clear Security Bags are one-time used security tamper evident bags. it is used to protect documents, cash, pharmaceuticals, evidence & anything you need to keep clean, dry and secure.